Group Photo: Pictured here are Martin Trust and Sharen Turney (front row center), Margaret Wright (back row center), Ed Kistner (7th from left) and Rick Paul (11th from left) alongside Ashroff Omar, Feroz Omar and the Brandix team. Also in the picture are Angela Lau (CEO - Clover Group International Limited, HK) and Emily Lau (CCO - Clover Group International Limited, HK) along with Michael Fernando and Viran Perera from Mast Industries Sri Lanka. 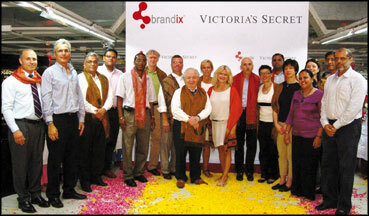 The sunset of July and the dawn of August saw a flurry of visits to Brandix ventures in Sri Lanka and India by the leadership teams of Victoria's Secret. Led by Sharen J. Turney, President and CEO of Victoria's Secret Mega Brands USA and Denise Landman, President of PINK - Victoria's Secret USA, two teams of senior executives from Limited Brands and Mast Industries reviewed the tremendous progress Brandix made with the Victoria's Secret business in recent times, assessed future potential and launched key new ventures that are expected to fuel growth. Amongst the many highlights, the progress made by Brandix in its Underwear business, its pioneering efforts in providing speedy solutions and its integrated Apparel City in India came in for high praise. These visits were momentous for Brandix and are expected to generate a fresh impetus for business, the leading apparel exporter said this week.